No documentation of National Socialism can be undertaken without the explicit recognition that the “German Renaissance” promised by the Nazis culminated in unprecedented horror—World War II and the genocide of European Jewry. 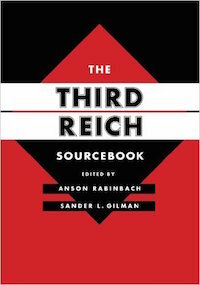 With The Third Reich Sourcebook, editors Anson Rabinbach and Sander L. Gilman present a comprehensive collection of newly translated documents drawn from wide-ranging primary sources, documenting both the official and unofficial cultures of National Socialist Germany from its inception to its defeat and collapse in 1945. Framed with introductions and annotations by the editors, the documents presented here include official government and party pronouncements, texts produced within Nazi structures, such as the official Jewish Cultural League, as well as documents detailing the impact of the horrors of National Socialism on those who fell prey to the regime, especially Jews and the handicapped. With thirty chapters on ideology, politics, law, society, cultural policy, the fine arts, high and popular culture, science and medicine, sexuality, education, and other topics, The Third Reich Sourcebook is the ultimate collection of primary sources on Nazi Germany.